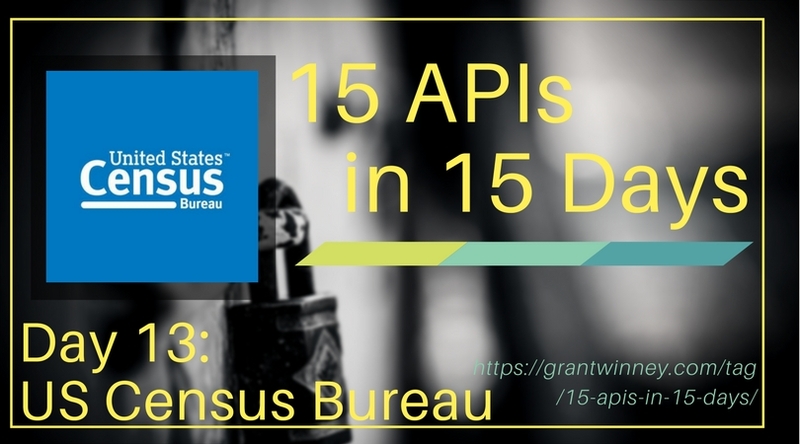 Continuing my search for 15 APIs in 15 Days (also on GitHub), today I'm writing about the US Census Bureau APIs, which provide access to American census data, demographics, housing stats, etc. It's all anonymous aggregate data that's already publicly available - no personal data. Your request for a new API key has been successfully submitted. Please check your email. In a few minutes you should receive a message with instructions on how to activate your new key. I got the email in about 30 seconds, clicked the link to validate the key, and was taken to a success page. Congratulations! Your key has been activated. You may now use it to query the Data API. Happy querying! Try your shiny new key with the geocoding API, a service for looking up addresses and getting a latitude/longitude coordinate - similar to the Google Maps geocoding API. "address": "50 Public Square Cleveland Ohio"
"benchmarkDescription": "Public Address Ranges - Current Benchmark"
I have pretty much no idea what all this census lingo means... it's like greek to me. I'm gonna pick one more API that seems fairly self-explanatory - language statistics. For the following calls, you'll need FIPS codes for states/counties and language codes, both available on census.gov. In the text files, the first number (02 or 39 below) is the state code, and 020, 035, etc are the county codes. The numbers reported by the following calls seem exceptionally low. Ohio has 11.5 million people, but the results say only a quarter million speak Spanish - there's no way it's that few. I'm not sure if it means primary language, or only language, or something else. Additionally, it probably depends on whether residents were even asked, and whether or not they chose to tick the box indicating they spoke Spanish. In other words, I don't think I'd trust this data without knowing more about its limitations. There are 490 Portuguese speakers in Cuyahoga County OH, and 241650 Spanish speakers in Ohio. The website is a little tough on the eyes - at least mine - but the information is all there. Once you pick an API, you can drill down into the documentation and find allowed parameters, sample responses and even sample usages. The JSON responses are a little weird, and makes it more difficult than necessary to extract a particular field from the results. I'd expect to see the previous results to be returned in a format like this instead, so (for example) querying on "EST" would return "12635".